After a dodgy looking day I decided to head up to Kumeu. It was unlikely that I would be able to get out observing this weekend so I decided to chance it. Left home early to get up to Kumeu Observatory and set up in the twilight. A passing shower was going through as I arrived but it looked good for at least some observing tonight. A little difficulty getting the mirror and the cradle to snap together tonight. Dave Moorhouse and Alan Kane turned up about 7:30PM to join me. NGC 6572 Planetary Nebula 98x Remakable PN, bright and green in colour. Makes a isocles triangle with two yellow stars to the east. Non stellar. NGC 6426 Globular Cluster 98x Very faint globular cluster, not resolved. Adverted vision makes the cluster easier to spot. IC 4665 Open Cluster 98x Large bright open cluster, too large for the FOV of this telescope. Ideal object for a RF telescope. NGC 6631 Open Cluster 98x Small open cluster, two levels of brightness. Has 10 members that brighter and then 30 to 40 stars in the background, almost part of the starry backgound field. There is a bright yellow (12th Mag) star on the NW edge. Cluster actually fits into a rombus shape of 12th Mag stars. NGC 6568 Open Cluster 98x Very large open cluster, nearly filling the FOV of the 17mm Nagler. 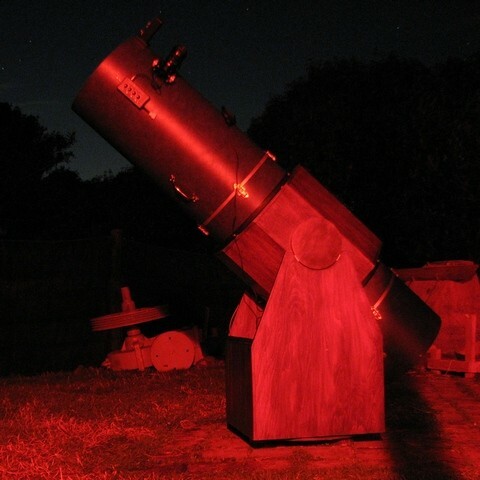 Over 200 members, and has a bright star (6th Mag) on the eastern edge. Has a C shaped asterism embedded inside the cluster. NGC 6644 Planetary Nebula 98x Faint planetary which makes a triangle with two 8th mag stars. Small and comparably bright with a nearby 13th mag star. Brighter than the star with adverted vision and non stellar. NGC 6638 Globular Cluster 98x Loose globular cluster, moderately bright and partially resolved. Possibly type 8, definately no core. M 55 Globular Cluster 98x Messier globular cluster. Very large and loose (type 10) globuar cluster. Fills the FOV and is very even in brightness. NGC 5822 Open Cluster 98x Very large bright open cluster with perhaps 250 stars. Loose but very well populated. NGC 5844 Planetary Nebula 98x PN in Triangulum Australe less than a degree from the Circinus border. Large and well defined, no central star noted. NGC 5927 Globular Cluster 98x Moderately faint globular cluster on the Norma / Lupus border. Small and probably about type 8. NGC 5979 Planetary Nebula 98x Easy PN, small and round. No other features of note, maybe higher power would help. NGC 5946 Globular Cluster 98x Faint, small, globular with an even brightness. A star is involved on the SW edge of the globular. Possibly type 9. NGC 5999 Open Cluster 98x Open cluster with about 50 members. Very even in brightness, compact and sparse. NGC 5882 Planetary Nebula 98x Small round planetary nebula. Very colourful being green, very planet like. A bright orange star (8th Mag) SE of the nebula. A few issues tonight with eyepieces that were not clean, some bright stars looked terrible but nothing a good clean won't fix. The 17mm Nagler was the best so I used this without the Paracorr. DSCs worked well again tonight. A good amount of observing was done, despite the cloud coming through at 8PM for 20 minutes and then from 9:30 onwards. At one point I was packing up at 8:15PM, but held out for another hour once the skies cleared again. A couple of green looking PNs tonight. NGC 5882 and NGC 6572. Good exponents of colour in deep sky objects. Both objects could have done with more power.